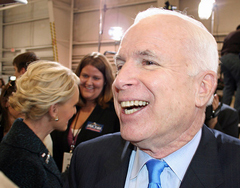 Republican John McCain spent the night in Wisconsin, as he gets ready to host a town hall meeting today in Racine. The presidential candidate flew into Milwaukee last night, waved to reporters at the airport, and left without saying anything. McCain will speak directly to about 15-hundred people at Racine&apos;s Memorial Hall. This is McCain&apos;s fourth visit to Wisconsin since becoming the G-O-P nominee, as his campaign focuses on key battle-ground states. Most polls give Democrat Barack Obama a double-digit lead in Wisconsin. Democrats will try to blunt the effect of McCain&apos;s Racine visit: three Democratic legislators will hold a news conference afterward, and the group One Wisconsin Now will again greet McCain with a skit linking him to President Bush.